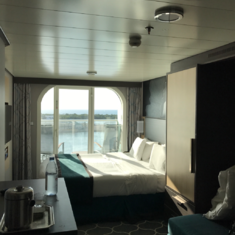 Harmony of the Seas has 2747 cabins and 87 cabin categories. See what each category has to offer and read cabin reviews from the community. Explore all 95 on board venues and features. 150 Central Park is the most exclusive, fine-dining restaurant on-board. 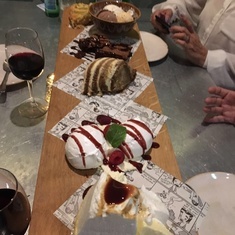 The sophisticated setting is perfect for our contemporary 6-8 course tasting-style menu, which pairs beautifully with our dynamic wine tasting program, and our club-style beverage service. 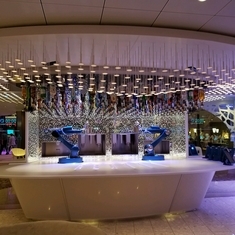 This bar is located on Deck 17 and offers a selection of refreshing drinks and beverage service. A pool by day - theater by night, the AquaTheater, is the place to enjoy spectacular water shows, aerial acrobatics and stunning ocean views. The Art Gallery features original artwork to view, browse, admire, and enjoy. Pop in to find something to take home, or to simply inspire the soul. There are currently 9 members sailing on this cruise. 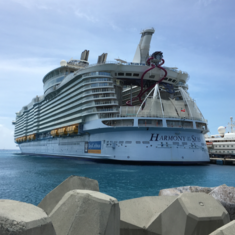 Carnival vs. Royal Caribbean: Smackdown!